Glendalough is one of the most popular tourist destinations in Wicklow and indeed all of Ireland. It is unsurprising given the stunning landscape, historic ruins and beautiful walks on offer at this unique location. Glendalough (or Gleann Da Loch, meaning ‘The Glen of the Two Lakes’) is situated in the heart of the Wicklow Mountains National Park, which has over one million visitors every year. The ancient monastery on the site is a fascinating site, having been founded in the 6th century by St. Kevin. Set in a glaciated valley with two lakes, the monastic remains include a superb round tower, stone churches and decorated crosses. The round tower is one of the most recognizable landmarks in the area. The site also includes a Celtic high cross, St. Mary’s Church and St. Kevin’s Church. The remains of three stone crosses and a stone fort are also to be found between the upper and lower lakes. 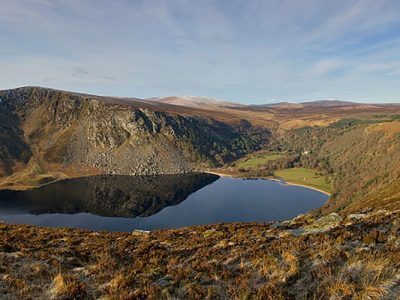 St. Kevin originally chose Glendalough because of its beautiful and remote setting. As more followers joined him, the settlement grew and grew, becoming a school. As well as the historic monastery, the remains of the Glendalough and Glenasan Mines are also to be found nearby. 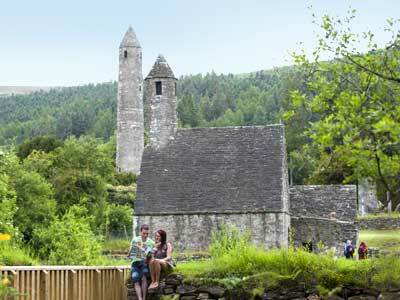 For more information on Glendalough during your visit, the Glendalough Visitor Centre is a must-see. It is situated adjacent to the monastic settlement and as well as an exhibition, contains an audio-visual demonstration.